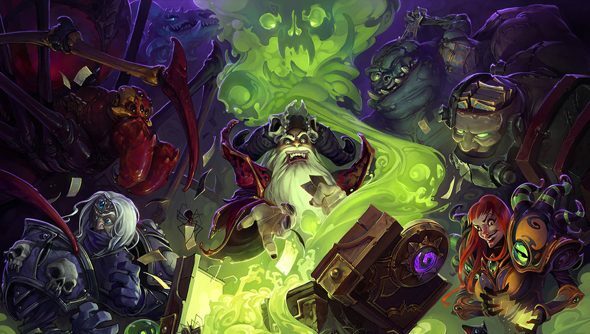 Blizzard’s first attempt to charge for Hearthstone DLC has gone awry. Some players who’ve bought the second chapter of the Curse of Naxxramas campaign we talked about this morning have been unable to access it. Others have found their accounts charged more than once. Blizzard have signaled to indicate they’re aware of the bugs, and are doing something about it. The second wing of Naxxramas’ crypt went on sale in Europe in the early hours of this morning. Players can buy entry to a series of single player matches for £4.99, 700 gold, or a combination of the two. There’s also an option to buy all five wings ahead of their release for £13.99 or 2800 gold. Some have been met with Shop Closed messages when attempting to purchase access to Naxxramas’ wings. But the unluckiest players have accidentally hit the purchase button more than once – and subsequently been charged for each extra misclick. “We are currently investigating the following issues affecting the new Hearthstone wing, the Plague Quarter,” said Blizzard. Failed gold transactions should see in-game money restored to player accounts within ten minutes – but real-money refunds can take up to 72 hours, because banks. Bit of a mess, this: are any of you lot caught up in it?